*Your details will only be used to send you our free North Wales newsletter and never passed to a third party. Bala: Accommodation, Attractions, Activities, Going Out, Shopping, Things to Do, Places of Interest, Outdoors, Llanberis Holidays, Llanberis Area Location, North Wales. Bala is a market town and community in Gwynedd and formerly an urban district of the historic county of Merionethshire. It is located at the north of Bala Lake. 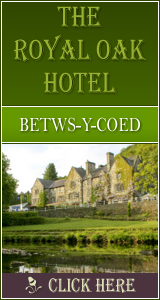 It is an ideal place for touring North and Mid Wales. The main street and its shops become quite busy with tourists in the summer months. The village provides all the essential services for visitors, such as banks, a post office and supermarkets. There are also interesting shops, inns and restaurants. Bala has one of the highest percentages of Welsh speakers in Wales, with around eighty percent of the population able to speak Welsh fluently. In the eighteenth century, it was well known for the manufacture of flannel, stockings, gloves and hosiery. The Tower of Bala is a tumulus of �moat-hill�, formerly thought to mark the site of a roman camp. Attractions in Bala include the Afon Tryweryn (River Tryweryn) which is world famous for its white water kayaking. The International Canoe Federation, the European Canoe Union and the British Canoe Union all hold national and international events there. Bala has campsites that cater for the canoeists from many parts of the world. There is also an annual music festival known as �Wa Bala� which is held in the town, hosting local Welsh bands. Llyn Tegid (Bala Lake) is the largest natural lake in Wales, and nearby are the mountains Aran Fawddwy and Arenig Fawr. Bala hosted the National Eisteddfod in 1967, 1997 and in 2009.